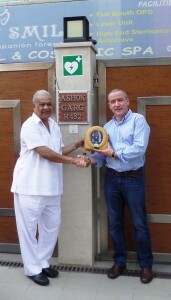 HeartSine® Technologies is pleased to announce that it has signed a master distributor contract with Aska Equipments Ltd. (http://askagroup.com/) to offer the company’s line of AEDs (automatic external defibrillators), aptly named samaritan® PAD (public access defibrillator), throughout India. Based in New Delhi, Aska is the largest manufacturer in India of fire extinguishing products (water mist technology) and lighting systems for disaster management. Aska will offer HeartSine’s complete range of samaritan PAD AEDs, which includes the SAM 350P, SAM 360P and SAM 500P. The company’s flagship samaritan PAD utilizes proprietary electrode technology, advanced and stable firmware, and proprietary SCOPE™ (Self-Compensating Output Pulse Envelope ) biphasic technology (an escalating and low-energy waveform that automatically adjusts for patient impedance differences) to assess rhythm and maximize effective shock delivery if necessary. Sudden cardiac arrest is a condition in which the heart suddenly and unexpectedly stops beating, causing blood to stop flowing to the brain and other vital organs. SCA usually causes death if it’s not treated within minutes.CPR alone will not restart the heart, so the American Heart Association recommends CPR combined with early defibrillation (within three to five minutes) for the best outcome. Aska, a pioneer in the field of specialized fire safety systems and disaster management products, is a market leader due to its ability to manufacture the best quality products with state of the art technology. Its innovative approach to developing fire safety (Water Mist & Compressed Air Form Technology) and disaster management products (Portable Inflatable Lighting System) has won accolades from various government authorities, as these products have proven instrumental in facilitating rescue work by police, fire departments and other mission critical operations during emergencies. Recognizing the emerging threat arising from CBRN disasters, Aska also has developed ground-breaking Toxic Chemical (Vapour and Liquid) Neutralizer and FASTACT (First Applied Sorbent Treatment Against Chemical Threats) based on nano technology. In the wake of fire accidents, natural disasters and CBRN threats, Aska is a one-stop shop for fire, disaster management and CBRN threats and exigencies. Established in 1985, Aska is an ISO 9001: 2008 certified company with a high-tech manufacturing base in Roorkee and headquarters in New Delhi.